Without further ado, I am most pleased to introduce the lovely and talented (and very brave!) Erin Fanning! As an avid skier, my favorite knickers are of the long variety and made from fast-drying Merino wool. 2.Do you believe in love at first sight? No, absolutely not, but I do believe in love at first joke—the fastest way to someone’s heart is to make them laugh. 3.I *heart* Peter Cetera. What song immediately swoops you back to your “first days” of falling in love? I met my husband while living in Seattle during the mid-1990s, so it would have to be Grunge bands like Nirvana or Pearl Jam. 4.Most romantic or sexiest destination out there. Camping on Round Island with views of Mackinac Island. 5. Favorite ice cream flavor. It's very much my pleasure to have Miss Erin on the Nuts today. SWN hosted her cover reveal a few months back and been looking forward to her return ever since! Her answer to #2 is the best yet. Not because I'm in that "No love at first sight" camp, but because laughter is truly the bonder of souls. And with the crazy life out there, we need it more and more as we grow older together. To not take everything so seriously. To joke away tension and misery. To see that lighter side to things. I can attest to the views on Mackinac Island for #4 being a Michigan gal myself and yes, you can never NEVER have enough chocolate. 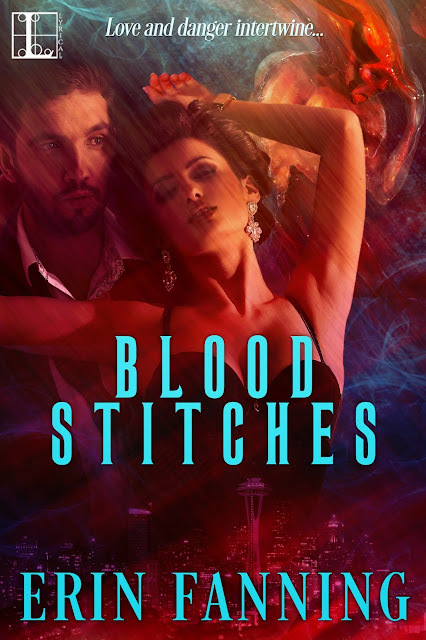 Do take a peeksie at Miss Erin Fanning's newest release BLOOD STITCHES. The book trailer is really good, and the book looks fabulous! Thanks for hosting me! And so fun to be part of Sundae with Nuts!